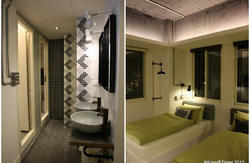 Star hostel is situated in the heart of Taipei city. We offer a clean, friendly and safe place for travelers. We are conveniently located on the beautiful tree-lined Zhongshan Boulevard, just 3 minutes away from MRT Zhongshan station and 10 minutes away from Taipei main station. Access to attractions in Taipei city and beyond is just a stone throw away. -Outstanding balance of stay is required upon arrival. We only accept cash payment for now, sorry for the inconvenience. -All reservations are not guaranteed past midnight on day of arrival unless advance arrangements are made by the guest. -We do not have elevator, please take this into consideration if you are carrying heavy luggage. - RECEPTION HOUR is from 8 AM to 10 AM. If you are arriving late/early, please notify us in advance. Head to bus platform and take Kuo Kuang Line 1819 to Taipei Main Station. The bus fare is NTD 125 and takes approximately 50 minutes to reach Taipei Main Station. From Taipei Main Station, walk north along Zhongshan North Road. It takes roughly 10 minutes on foot. If the weather is bad, head into Taipei Main station and take MRT to Zhongshan Station instead. Head to taxi station outside airport arrival hall to board taxi. You can tell the driver Star Hostel is very close to Zhongshan North Road and Nanjing West road intersection. The whole trip should take approximately 45 minutes and cost roughly NTD 1300 by meter. Take either exit 1 (escalator) or exit 3 (stairs). Walk eastward along Nanjing West Road until you reach Zhongshan North road intersection. Turn right and walk southward along Zhongshan North road until you reach No. 132 . It takes roughly 3 minutes on foot.